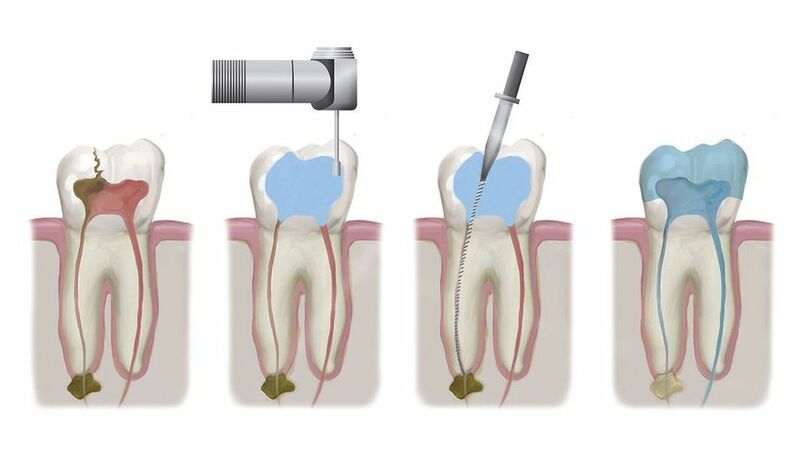 Root canal therapy is an endodontic procedure that can not only relieve significant discomfort but also help to save your tooth from loss or extraction. At our office in Fairfax, VA, we use the latest in dental technology and techniques to carefully remove infected tissue and restore a tooth that has been damaged by trauma or decay. With decades of experience, Kenneth R. Giberson, DDS, can deliver a personalized, comfortable experience and help to protect your oral health. Dr. Giberson may recommend root canal therapy if the pulp, or inner tissue, of your tooth has become infected or inflamed. Infection or inflammation can be caused by a number of conditions including deep decay, a crack in your tooth, or even damage resulting from previous dental procedures. During an endodontic treatment, Dr. Giberson will remove infected tissue and thoroughly disinfect the tooth. He will then fill the tooth apply a dental crown to restore form and function to your smile. Root canal therapy can be performed in as few as two visits to our office. In addition, modern practices and anesthetics have significantly reduced the discomfort traditionally associated with this procedure. If you are experiencing prolonged discomfort, it is important to schedule an appointment with Dr. Giberson to discuss your options and prevent further damage. During your consultation, he will listen carefully to your unique needs to provide the best treatment plan for you. It is important to understand that some patients in need of root canal therapy will experience no symptoms, which is one reason why it is so important to attend regular check-ups. To determine candidacy, Dr. Giberson may request x-rays to examine the shape of the root canals and look for signs of infection. These scans will help him to create an effective treatment strategy. If you decide to proceed with treatment, Dr. Giberson will first administer a local anesthetic to ensure your comfort. He will then carefully remove infected pulp, nerve tissue, and debris. Using a filer, your dentist will thoroughly clean and disinfect the root canals. He may also flush the tooth with a special liquid for optimal results. The tooth is then filled with a rubber-like substance and the entry point is temporarily sealed in preparation for your final restoration. In most cases, a porcelain crown is applied to the tooth at your next visit. During root canal therapy, your dentist will remove infected pulp and tissue and meticulously clean your tooth. To ensure a timely recovery, it is important to follow post-treatment care instructions provided by our office. For the first few days, you may experience sensitivity, which can be managed with over-the-counter pain medication. Our office can also provide you with prescription medication as needed. An untreated dental infection can be detrimental to your overall dental health. The infection can spread from the affected tooth to your gums and surrounding tissue, which may result in an abscess. In addition, you may suffer from tooth loss, which can lead to more serious conditions like bone recession and dental misalignment. However, if you address the infection in a timely manner, you can avoid more extensive and costlier treatments down the road. Do not place yourself at risk for developing serious oral health complications. Dr. Giberson can perform virtually painless root canal therapy in our comfortable, relaxing office. To protect your teeth and end unnecessary suffering, fill out our online contact form or call (703) 273-2040.